In a soup pot set over medium-high heat, melt the butter with the oil. Once it sizzles, add the onion and chile and cook for 3 to 4 minutes, until completely wilted and beginning to brown. Add the corn and salt, stir, and cook for another 3 minutes. Add the epazote or cilantro and stir. Pour in the chicken broth and bring to a simmer. Then cover, reduce the heat to low, and cook for 7 to 8 minutes. Turn off the heat. Pour the soup into bowls and serve hot. Top with queso fresco. A lovely soup for a for a sunny spring day. This was so fun to shop for! My fiancé is from Monterrey and I enjoy when he takes me to the Latin super markets to shop. Super simple to make and packed with all the right indgredienta to warm you up when it’s brisk outside. It sounds like you had so much fun making (and eating 😉) the soup, Elaine! iHola Pati! Have you ever tried this recipe with grilled corn? Oh that will be delicious, Cynthia! Aww thank you so much, Hafeezah. Hi Pati, I made this tonight for my daughter and I and it was so delicious! I have been in a food rut of the same few recipes and watching your show and seeing your recipes has pulled me out of it! Thank you! So happy to help you out of your food rut, Cherie! Hola Pati, I have been wanting to make this soup ever since I saw it on your show. You made it look so easy and delicious to prepare; it did not disappoint! The sweetness of the corn, the saltiness of the broth, the creaminess of the cheese, and the fresh zing from the cilantro and jalapeño (no time to visit Mexican market for epazote but happy to use cilantro from our yard) – mmm, happy tummies all around the table. Even my son said “Thank you Pati”. Awesome! And say hello to your son for me, Rayna. I’m so glad you made the recipe your own, Colleen! So fresh and savory too.Easy to prepare, everyone loved it! So happy to hear that, Rebecca! Excellent soup! Feliz de comer cositas oaxaqueñas! Is this soup from Oaxaca? Yes! I first tried a version of it in Tlaxiaco, which is in the Mixteca Alta región from Oaxaca. My Mexican girlfriends (and I) LOVED the soup! We even watched the episode on my DVR while eating. You have 2 new fans. 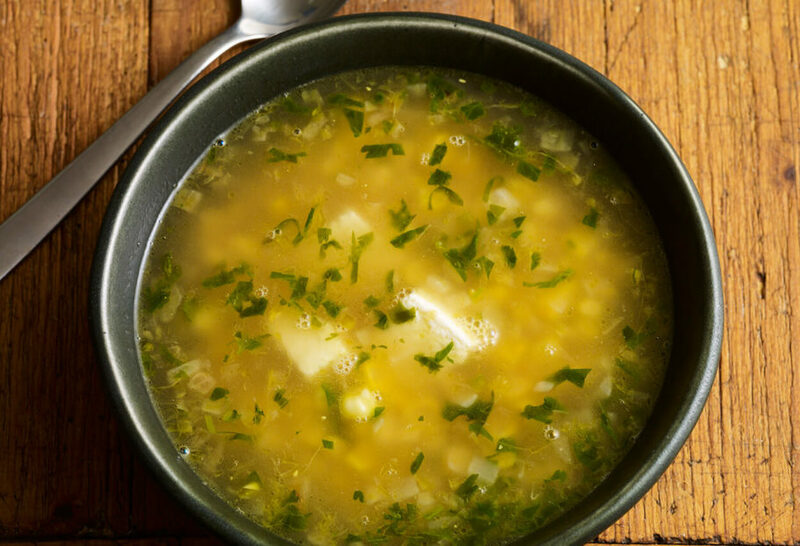 Please please please…show us how to make caldo de res. I cannot remember if u put cabbage or calabacita or both and what kind of beef do u use, etc. Also, is it basically the same recipie for caldo de pollo? BTW, the leche quemada ice cream looks very good. My parents love leche quemada and I think the kids will love the ice cream version. Ur show is the best! Saludos desde Texas! Absolutely! But don’t freeze it with the cheese…add the cheese fresh when you are ready to serve it. What can be substituted for epazote? If you can’t find fresh or dried epazote you can use fresh cilantro…it is a different taste but also delicious!